A remarkable transformation is occurring in advanced capitalist economies. Home ownership and housing more generally is becoming unaffordable for large swathes of citizens. 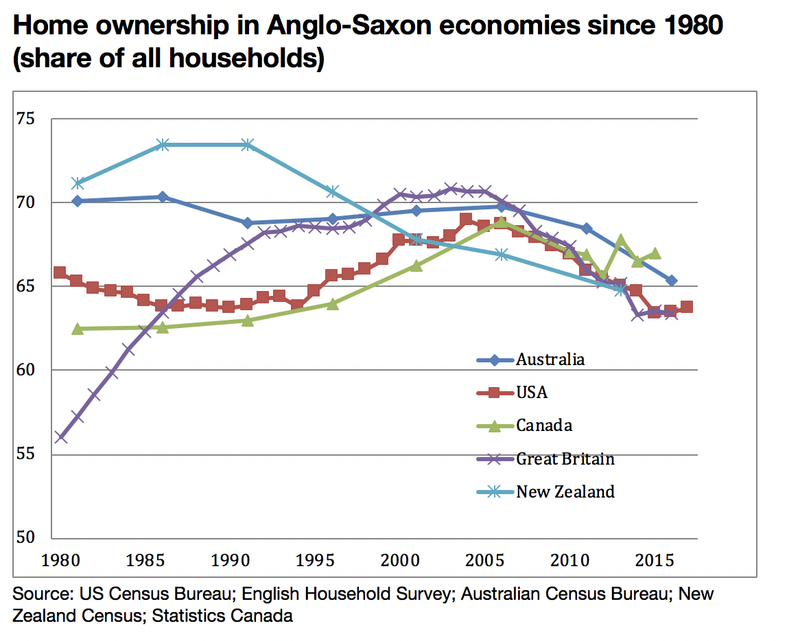 Anglo-Saxon economies — where home ownership is deeply culturally embedded — have been particularly badly affected. In big cities such as London, Manchester, Sydney, Melbourne, Auckland, Vancouver, Toronto, Los Angeles and San Francisco, median house prices have risen to over seven times median incomes — with three times generally seen as ‘affordable’. The hardest hit have been younger adults: the ‘millennials’. In the UK, for example, in 1996 two-thirds of 25-35 year-olds on middle incomes owned a home; by 2016, this had fallen to just a quarter. In the United States in 2004, almost 45% of the same age group were home owners, a figure that dropped to 35% by 2016. In Australia, home ownership among the under forties declined from 36% in 2001 to 25% in 2015. The foundational promise of liberal capitalist economies that ‘if you work hard enough you can have a home of your own’ no longer holds true. There have has been major falls in the levels of home ownership since the turn of the century across all the major English-speaking economies, as shown in the chart below. How did we get here? The explanation you will most likely hear in the media and from many politicians is that we are not building enough homes. The culprits are usually the planning system, the construction sector or excessive immigration. While these are certainly relevant factors in many countries, they are not so useful in explaining the housing affordability crisis of the last few decades shown in the chart above. Planning systems did not suddenly become more restrictive at the turn of the century or construction firms more monopolistic. House prices have been rising even in cities with stable populations. To understand today’s housing crisis, we must go beyond just looking at the supply of housing and examine demand, in particular the demand for housing as a financial asset and land as a form of collateral. And looking at the demand for housing and the land underneath it leads us to consider much bigger questions about the social and economic structure of modern capitalist economies. In particular, the increasing political preference for home ownership over other forms of tenure, coupled with wider shifts in political economy, have led to two important — and perhaps unintended — developments in the housing and land market. Firstly, the windfall gains that naturally accrue to landowners in a growing economy — generally referred to as ‘land rents’ — have been allowed to grow as taxes on property and the public provision of affordable housing have both withered. Secondly, and most significantly for explaining the rises in house prices in the last two decades, the deregulation of the financial system has created a positive feedback cycle between finance and house prices. Finance has become addicted to property just as citizens in many capitalist economies have come to expect to own a home. When property prices rise faster than incomes, it becomes harder to buy a home. Mortgage loans bridge this gap, allowing households to access home ownership without having to save for many years. But there is a side-effect. Banks create new money in the act of lending. When a bank makes a loan, it creates both an asset (the loan) and a liability upon itself in the form of a new deposit in the bank account of the borrower. No money is borrowed from elsewhere in the economy. The main limit on bank money creation is the bank’s own confidence that the loan will be repaid. If mortgage lending supports the building of new homes, this new money can be absorbed into the economy. However, in most cases mortgage finance enables people to buy existing property on existing land. As households, supported by banks, compete to purchase, the result is increasing land and house prices. Higher prices lead to more demand for mortgage credit, which further pumps up prices, and so on. This feedback cycle runs against standard economic theory where an increase in the supply of goods, all else being equal, should eventually lead to a fall in prices. An ‘equilibrium’ price will be reached at the point when the quantity of goods supplied exactly matches the demand for them. But with bank credit and land, we have two phenomena that are quite unlike standard commodities. Bank credit is highly elastic and essentially infinite; in contrast land, as discussed in the preceding chapter, is inherently inelastic due to its scarcity. 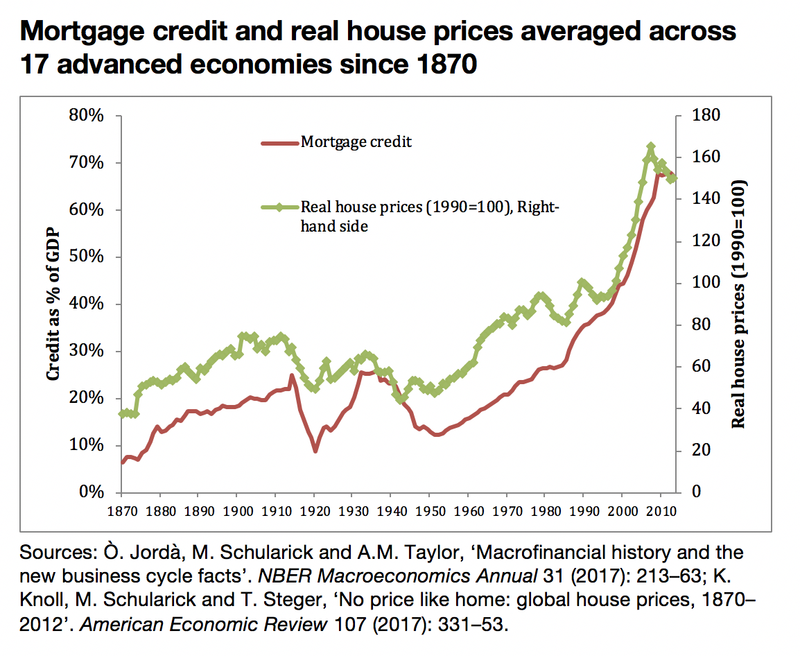 The chart below shows real house prices (adjusted for inflation) and mortgage credit as a proportion of GDP in advanced economies since 1870. Up until 1960, there was little change in house prices despite rising populations and incomes. Then, from the 1960s to the 1990s, house prices increased by around 65%, supported by the reduction in taxes on property and the withdrawal of state provision of affordable housing and gradual expansion of mortgage credit. But even more remarkable has been the change in the last 20 years, when real house prices have increased by 50%. During the same period, real average incomes have flatlined — but mortgage credit has risen exponentially. There is a clear correlation between the two variables since the 1990s. The visual evidence above suggesting a close relationship between mortgage lending and house prices the last 30 years, is backed up by statistical studies examining a range of supply- and demand-side factors. In a study of 19 countries between 1980 and 2005, the Organisation for Economic Cooperation and Development (OECD) estimates that financial deregulation enabling an expansion of mortgage credit has increased real house prices by 30%, far more than other variables. A similar study by the International Monetary Fund (IMF) but extending to 2010 found that a 10% increase in household credit leads to a 6% increase in nominal average house prices. The study also found that increases in house prices lead to a further growth in credit, confirming the positive feedback cycle between mortgage credit and house prices. ‘Residential capitalism’ is no longer a sustainable path for modern economies. Deep systemic reforms will be required to break free of the housing–finance feedback cycle. But we are not starting from scratch. A number of economically successful advanced economies have found ways of keeping house prices at more manageable levels relative to incomes. Key to this has been maintaining tight control over mortgage credit creation. Countries with more flexible mortgage markets, high levels of securitisation, variable interest rates and high levels of equity withdrawal tend to have high and more volatile house prices. The more liberalised the financial system, the stronger the feedback between house prices, consumption and the wider economy. Complementing tighter regulations should be the creation or expansion of state investment banks and stakeholder banks able to provide long-term, high-risk capital to support innovation and provide the next generation of infrastructure needed to support the transition to a low-carbon economy. The huge demand subsidies that governments have showered on home ownership would be better employed stimulating capital investment and innovation in more productive sectors of the economy, which have suffered under austerity policies. The public sector must also take a much more interventionist role in shaping the land market and ensuring it creates public value, not just short-term capital gains or rentier incomes for speculative domestic and international investors. Retaining public control over land and the usage of land appears key. It is remarkable that house price-to-income ratios have been moving in the opposite direction in Western democracies and mature East Asian economies such as Korea, Japan and Singapore. But in these latter economies, land and the economic rents from rising land values are socialised to a much greater extent. If large-scale land nationalisation is not politically feasible in Western democracies, then perhaps we need to accept that the dream of the ‘home-owning democracy’ must now be abandoned and consider the idea of more balanced tenure mixes. Western European countries such as Germany, Austria and Switzerland have not experienced the rapid house price increases of the majority of the West, but all have home ownership levels at or below 50% and enjoy generous provision of rental and social housing. Anglo-Saxon economies should follow suit and end the favourable fiscal treatment of home ownership over other tenures. Private renting, public and cooperative housing systems must be properly funded. Taxation systems in general need to move away from labour and on to land rents. And our political leaders must be brave enough to stand up to vested interests and make the case for housing returning to be primarily a source of shelter not a financial asset. A new narrative focused on secure, affordable housing for all citizens as a right must be established, as opposed to housing as a means to securing financial wealth. As home ownership moves out of the reach of more and more young and poorer households, this process should become easier. But the key will be to find a way of de-linking our financial system and wider economy from where we live without causing financial havoc. Governments should be taking steps now to direct finance towards more productive ends, not least the creation of housing and transport infrastructure that would boost economic growth and consumption but ease pressure on our cities. A gradual, managed house price deflation is required with demand coming from investment and production, not off the back of rising asset prices. Then we can begin to break free of the housing–finance feedback cycle. This is an edited extract from Why Can’t You Afford a Home? by Josh Ryan-Collins, published by Polity Books. 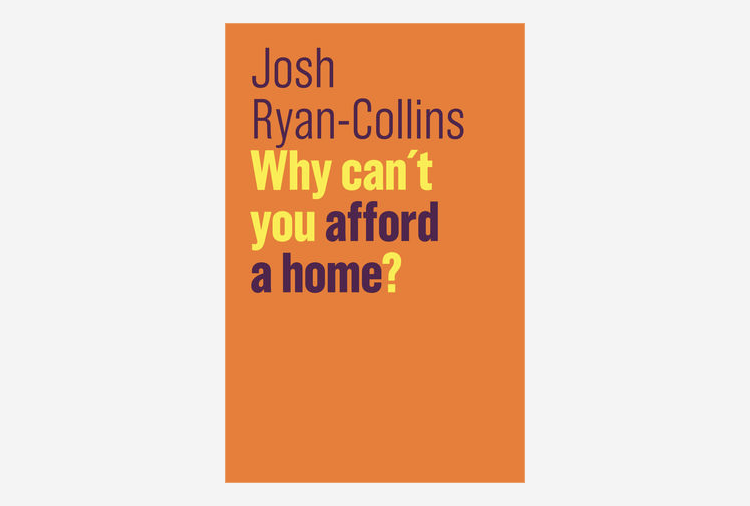 Watch Josh’s launch lecture on Why Can’t You Afford a Home below. Sign up to the UCL Institute for Innovation and Public Purpose’s mailing list to hear about our latest research, news and events. You can follow us @IIPP_UCL.